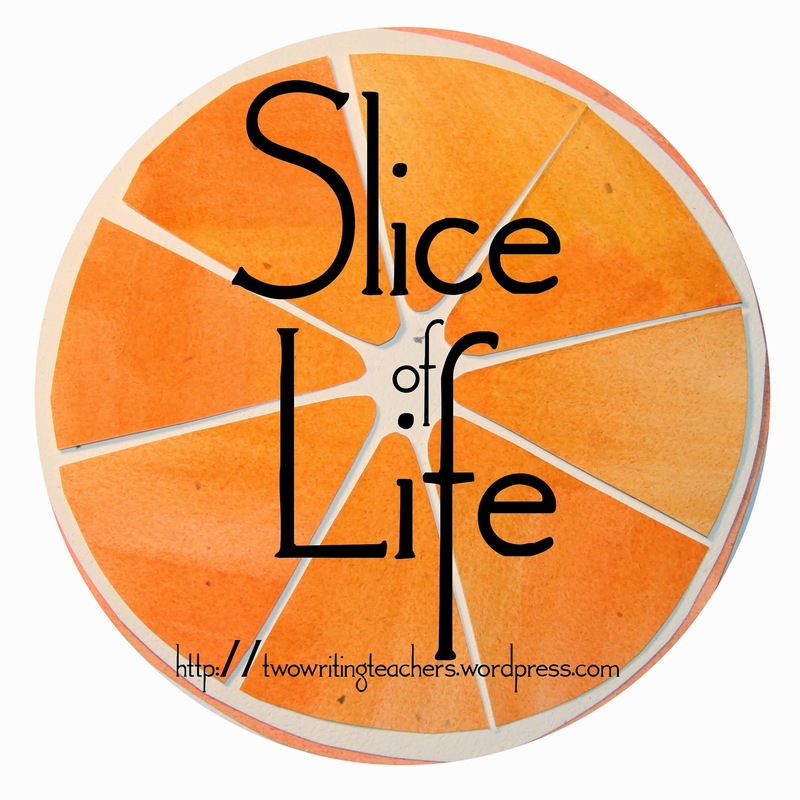 Since I plan to write every day in March as part of the Two Writing Teachers' Slice of Life Challenge, I won't feel guilty about sharing just a brief thought . . .
Last Friday, I left my classroom a little early and slipped over to another school, where Laura, my Teaching Resident from last year, now leads her own Pre-K class. She was having an "Engineering Exposition," featuring Three Little Pigs' houses, created from recyclables. Laura had set up the most gorgeous displays, with beautiful and detailed documentation of the engineering work. How to describe how I felt? Is this not unlike watching one's own child succeed? It was breath-taking, to see Laura in action in her own classroom. The families were surrounding her, children showing their work, parents asking questions and beaming. Everyone was so at home! What a happy community! A very special experience for me. In recent weeks, I have been intentionally working on 'planning' with Melissa (Teaching Resident), trying to show her how I create instructional units and daily lessons for preschoolers. I'm trying to provide her insight that will help her not only in our classroom, where we team together on the children's learning, but in her future classrooms where she will have new and varied demands. I want ... I hope ... to open her eyes to the amazing possibilities of preschool curricula. How do I plan lessons? For me, this simple and straightforward question does not have a simple and straightforward response. So, why not try to write a blogpost that gets to the heart of how I plan? I have been wrestling with this writing in much the same way that I wrestle with my planning discussions with Melissa. Planning - and writing about planning - is a very creative process, where I focus on several things simultaneously and thus find myself a little tongue-tied in my explanations. Bear with me, please! Kid need experiences to attach words to...if it’s not in the heart, hands, bones, it’s not in the brain. Young children need to "do," to actively experience their learning. When I create learning experiences that involve these elements, preschoolers are engaged and happy. Ideally, all or several of these activities are happening at once. I love centers that provide varied activities and allow children to be individuals "in charge of their own learning" - exploring in different ways, at their own pace, at their own choosing. THESE CHILDREN FIRST Also - more importantly - I believe the students themselves should be the drivers of the "theme"/the "topics." Each year, when I get to know a class of preschoolers, they lead me towards new fun ideas for exploration. It is essential that what I prepare to do with children be of interest to the children in this class. This means that I spend a great deal of time observing, listening, and documenting what they are doing, saying, questioning - and their questioning is perhaps the most important aspect of the observations. If I can figure out what the children are wondering about, I have a great catalyst for learning experiences. I am continually surprised and enlightened! mathematical - especially counting and quantifying, measuring, recognizing shapes. This is probably not a complete list - just one that comes to me off the top of my head. However, these skills are the essential elements of any planning for me. These skills are what I want to nurture in children during preschool - how I best prepare them for elementary school and beyond. These skills can be cultivated through innumerable themes, in so many different ways. However, data does not drive my instruction but it is an intentional element "behind" my instruction. Data happens from my instruction and informs my planning, showing me what students are working on, what is challenging them, where they are developmentally. I know that I am required to collect data on certain things and I weave those data requirements into the plans. For example, I am expected to keep data on children's ability to write alphabet letters. There is no need for me to set up a specific lesson on this - tasking children, one-by-one, to practice writing the alphabet. [I can't think of anything more boring for three year olds!] However, I intentionally plan writing elements into all that we do - having children sign their own name on projects, writing letters and cards in the writing center, creating grocery lists in dramatic play, drawing blueprints for block-building and engineering, etc. etc. etc. These activities are playful and reflect my goal of "children first." Plus, I get rich data from these activities - they tell me who loves to write, who is not interested, who is struggling. Writing becomes an integral part of all that we do, something the children begin to perceive as routine and valued - reflecting the higher goal of "what do they need to learn." Teachers need to work with these larger school/system expectations but I don't believe they have to be limited by these. It is a personal goal of mine to teach the way I have always taught, to provide the playful, rich, exploratory experiences that I believe in my core are the best for children - and to show how I can still meet these outside expectations/requirements. I work hard to show the learning behind the play. WHAT DO I NEED OR WANT? - Honestly, another essential element of my curriculum planning is ME. What do I enjoy doing? What jazzes it up for me? When the children see me happy and excited about some learning adventure we are on, this fosters enthusiasm in them. I see this with engineering - I love to build with recyclables and I have whet the appetite of many children in so doing. I shy away from teaching the same thing in exactly the same way each year. This is what keeps my work stimulating and fun for me. One of the best examples of putting myself "in the mix" of my planning is our current overall theme - Ezra Jack Keats. This past fall, I went to see an Ezra Jack Keats' exhibit in Philadelphia (which I mentioned in an earlier blogpost)...and I decided I wanted to introduce him to my preschoolers as an author study. I sat down with Melissa to plan out this author study - How would we share Ezra Jack Keats with our preschoolers? What do we want them to take away from this experience? What do we want them to explore? With all this in mind, we created a curriculum web of our plans - really, a diagram of our brainstorming. It included what books we would read, what activities these books might lead to or be best supported by, and what the "grand finale" might be for our efforts. (We will present children's work at our next Learning Showcase/parent night). During all our read-alouds, the children try to guess what the book is about from the book cover. Additionally, have they seen the character(s) before? What previous book had that character? We have had an on-going project of engineering individual apartments or houses out of recyclables. The children have created their own stories to accompany these. Melissa has encouraged the children to revisit their home design many times, to ensure that it includes as many details as the child has hoped to include and to make any modifications that are desired. These have been a fun way to assess children's knowledge about spatial relationships; while she works with small groups of children or one on one with a child, Melissa asks such questions as, What is next to your bed? Is there a room above you? What is behind this? We have taken pretend elevator rides at whole group time. Here, we jump in close together as if getting on an elevator together; someone calls out a floor number and we pretend to move to that floor, steadily moving our bodies up, up, up, taller. Then, the pretend elevator doors open and we are in another story by Ezra Jack Keats. I lead the children through a dramatic re-enactment of a scene, the story's problem, perhaps some well-known line from the story, to see if the children can recall the characters' names, the title of the book. This is almost a guessing game for the children, and it is received enthusiastically. Children love to dramatize and I believe it helps get knowledge "into their bones." Almost every day has included another fun, process art experience - where we create different designs and textures on paper. 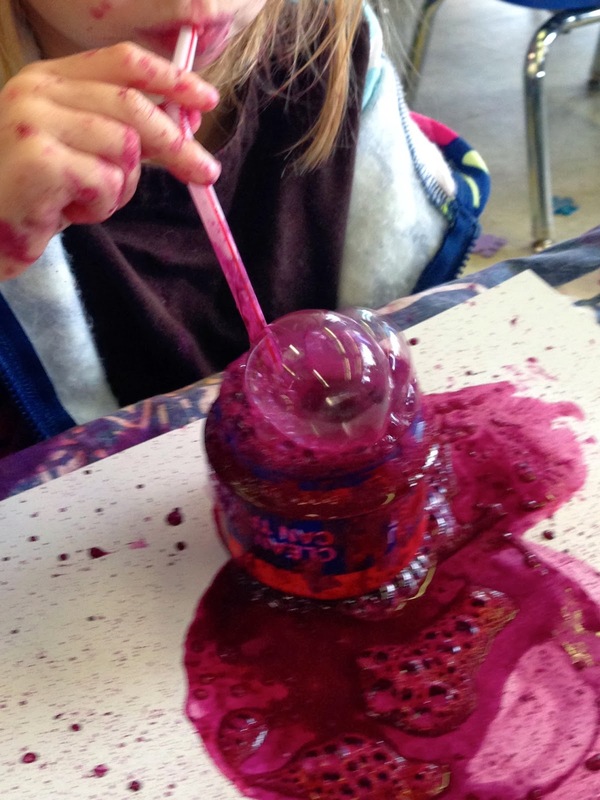 We have used chalk, pastels, watercolors, shaving cream, sponge stamping, and much more. Our Learning Showcase will feature each child's collage art from these special papers, imitating Ezra Jack Keats' artistic style and sharing a personal story. We are now working on an Ezra Jack Keats-inspired piece for our Phillips artwork. [Our school partners with the Phillips Art Gallery each year, creating an exhibit of our students artwork for their Young Artists Exhibition. 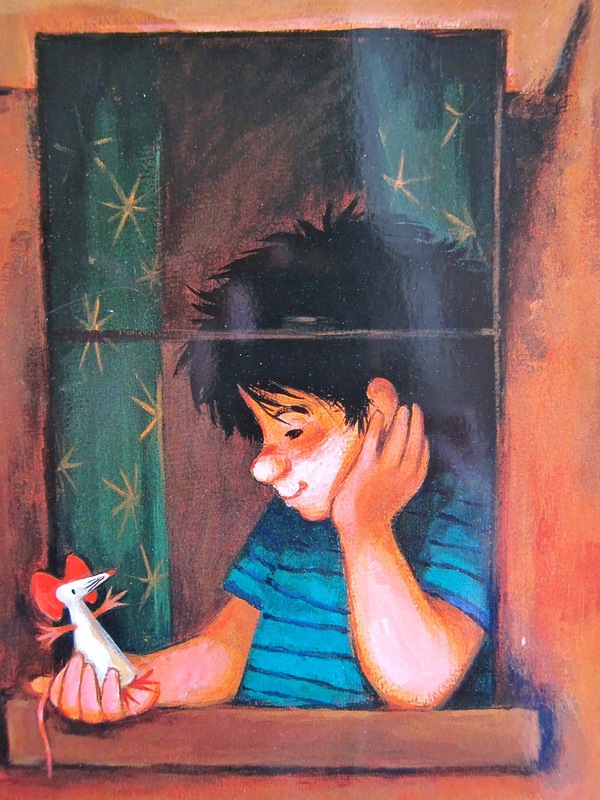 This year's theme is storytelling and our Ezra Jack Keats focus has dovetailed beautifully.] Our art teacher, Brianna, worked with the children in small groups to observe the surrounding city buildings from the top floor of our school. 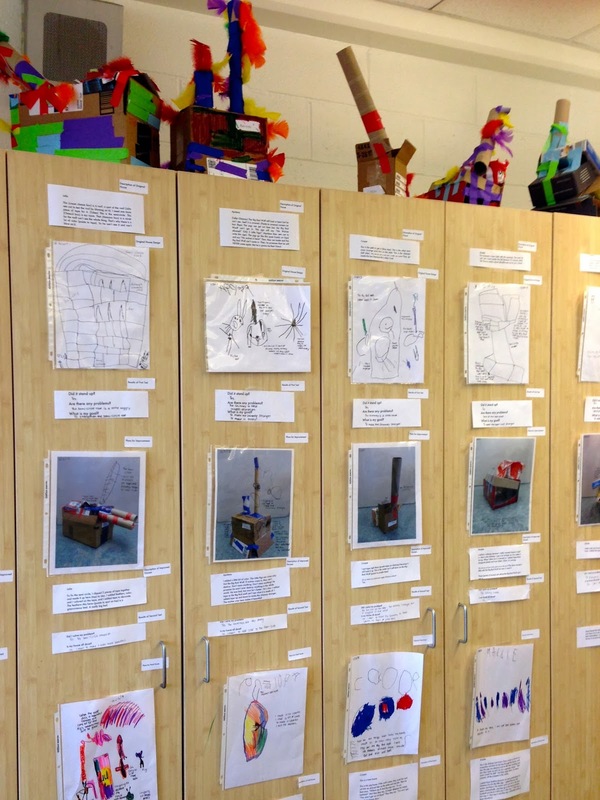 From this high perspective, the children drew city buildings and skylines. These will be collaged onto a beautiful, vibrant "sky" background. Accompanying this artwork will be the children's own story about "The Big Cats in the City." Believe me, curriculum planning can feel confusing and hazy at times...seemingly unending, spiraling into never-ending possibilities. You are continually trying to plan from the perspective of the child - What entices them? What keeps them engaged? What would be fun? Of course, you then have to fit the plans into the actual preschool day, in and around our walks, naps, visitors, field trips and special events, and, in recent weeks, snow days and delayed openings. However, wrestling with planning in this way is invaluable. 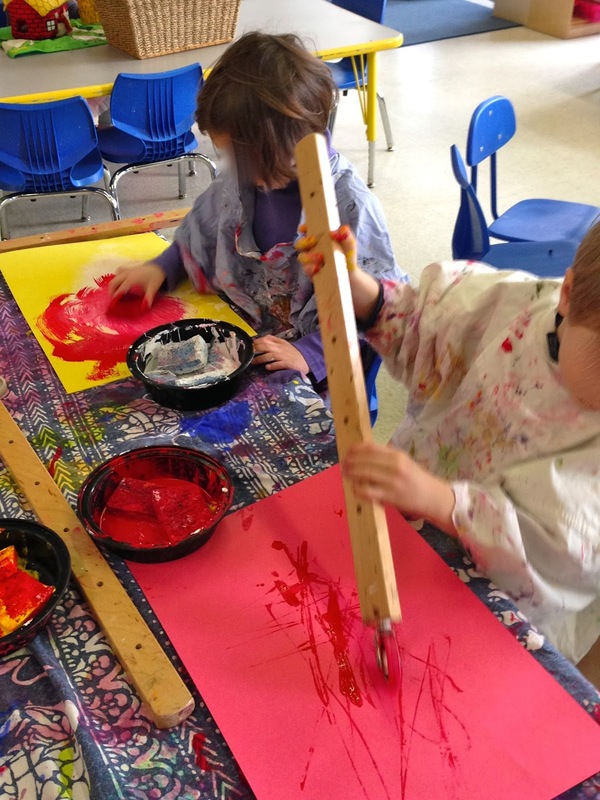 Our Ezra Jack Keats' unit has nurtured our interests in family, home, friendships, city, and community - topics that are near and dear to these preschoolers. Seeing the children's interest in his imagery, Melissa has begun planning her own unit that is a tangent of our Ezra Jack Keats work: shadows and light. I love planning this way - it is creative and "alive." And, yes, unending. We had snow days last Thursday and Friday - which meant we had a five day weekend, due to President's Day yesterday. Today, we returned to school! 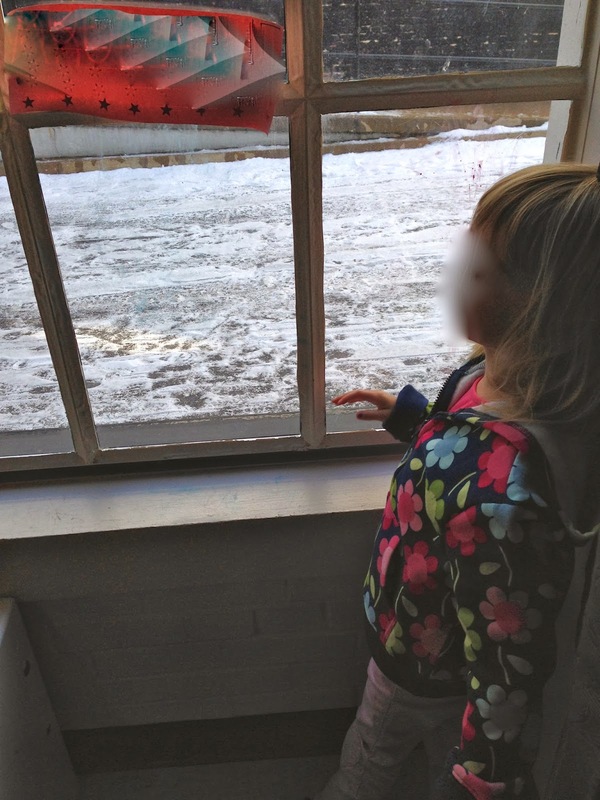 We have had such an inconsistent calendar this winter, what with delayed starts and snow days, plus ice cold, freezing temperatures that have resulted in lots of indoor play. Preschoolers do not thrive on such a broken routine. by mid-day the temperature was in the 40s. I suggested we take a walk outside today. Today, we returned to school and our normal routine! we had to get our coats on. Plus, we had to remember how to line up with the walking rope. "we all must go outside together - all for one, one for all!" Finally, we corralled the reticent and unwilling to get their coats on and join us in the line. We had spent some 20 minutes just getting everyone ready to go out the door. Out the door of the school we went! the sidewalk was still frozen over. Today, I learned that it is near impossible to guide 22 preschoolers on a walking rope over ice. We froze in our steps. holding the walking rope with the other hand. The once leaders became the cabooses. We'd been outside for at most 5 minutes. Today, we returned to school. Our normal routine remains elusive. What if we changed the room around? Melissa and I changed the classroom around. Not just one bookcase or some small corner - but, the entire room. This isn't something I typically do in the midst of a preschool year. I can't say that we took the most planned approach to this...we spent a simple hour after school one day, yanking furniture this way and that, thinking about what we hoped would happen once we were done. We wanted children to be more intentional in their play and less like "pinballs" - less zooming, more lingering. Pushing furniture this way and that, we created more small group areas - more defined centers, if you will. 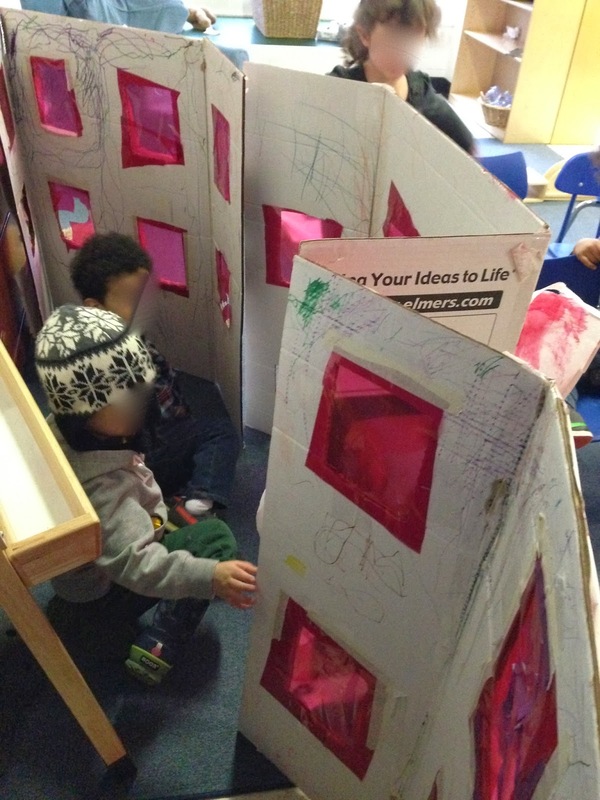 We moved the gathering area to a more central location, along our wall of windows, encompassing our dramatic play area (giving a defined space to this whole body, theatrical play) - and we surrounded this carpet with our small group areas. We have had three awesome days of school since this room change! The children were initially surprised - astonished - by the room's differences, but they embraced them. They began investigating every part of the room, seeming to re-discover it. We had a great discussion about what was the same and what was different - noticing the details, like all writers, scientists, artists, scholars, thinkers do! We see children playing in a whole new way. Yes, they are much less frenzied and much more focused. Children who were stuck doing certain challenging behaviors have not yet repeated them in this new space - for example, a couple children would hide at whole group time. Well, the new room means that those old hiding spots are gone (and they have not yet discovered new ones!). The new arrangement has caught them off-guard, allowing them to join us...and I believe they have discovered that whole group time is fun. 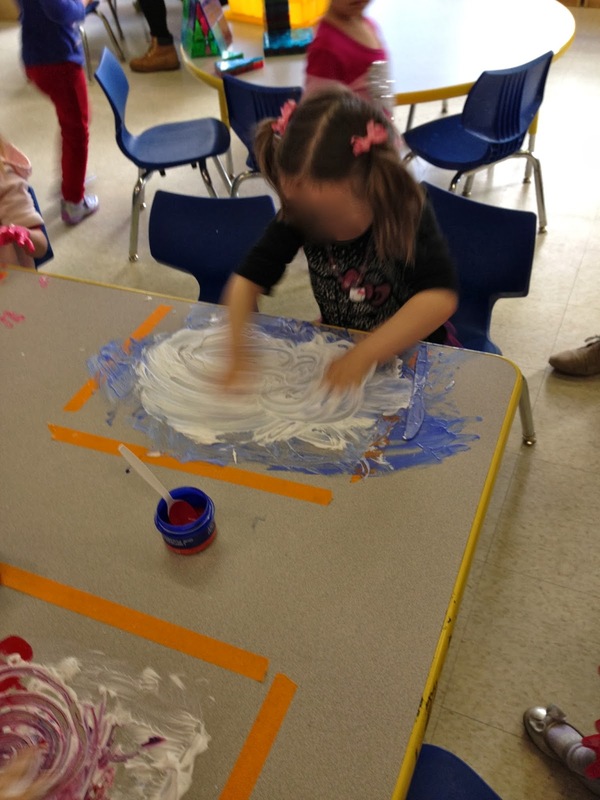 Now, when we dismiss the children to centers, they first share aloud where they plan to start their fun. This simple, orchestrated act of choosing a center helps the children work with a sense of purpose in each area. We find ourselves, as teachers, being the "guide on the side," standing back and observing - a sign that the environment is working for the children. It is right for them. It is just the change these children needed at this time of year. It is just the change we teachers needed, too! I am determined to write a "slice of life" today, having missed last week . . . and topic after topic has crossed my mind. Last night, I thought . 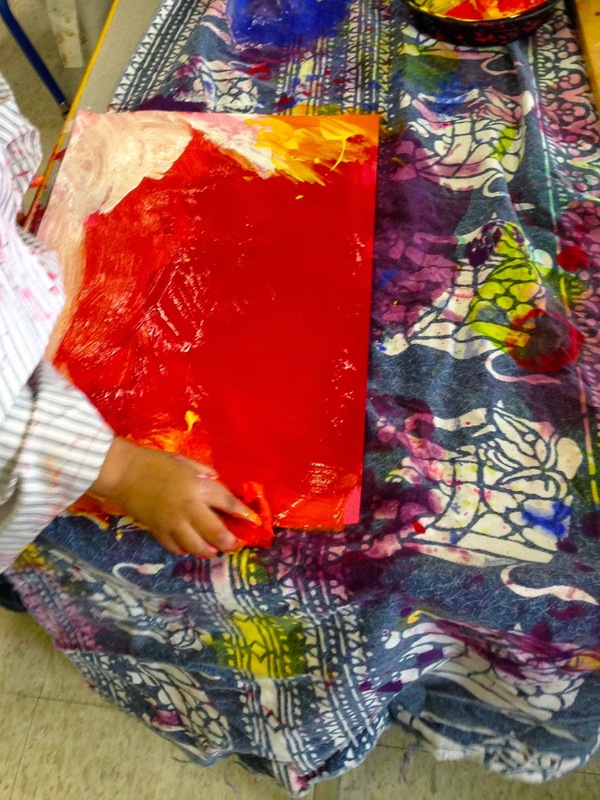 . .
. . .I'll share about the fun we are having with our Ezra Jack Keats author study. oh, that blogpost would need extensive work/time, something in short supply today. . . there's so much I want to share about this curriculum . . .
. . . I'll simply share about our special time last week when . . .
Next, the school day was underway, and our time in centers flew by as children sponge painted beautiful pictures in red, yellow, and orange; everyone's hands were covered with paint, even the floor was speckled, and I thought this is what I should share about . . .
. . . We have really been enjoying messy process art activities over the past few weeks . . . how much children love paint, whether using brushes, rollers, sticks, sponges, spoons, straws...they cannot get enough paint! Next, we were outside on a short walk, to the turn-around tree, enjoying some very rare fresh air, and I thought . . .
. . . Oh, wow, I really should write about the challenges of too much indoor play . . . how this affects kids . . .
Then, it was lunch time and I was in the whirlwind of washing hands, finding seats, helping to open lunch foods, finding straws and extra spoons, racing out of the room with a couple children who simply couldn't wait one more moment to go to the bathroom, when I returned to the room to find . . .
Hughie's Dad seated at the lunch table with Hughie and his classmates. before I had raced the children to the bathroom? All eyes were on this new, surprise adult. Dressed in a nice business suit, no less! to have lunch with him. He sat in a child-size chair - and it looked absolutely natural. So right. His table buddies were full of chatter, questions, and antics for Hughie's Dad. No one rushed their lunch. No one threw away their lunch without eating (as is sometimes the case). All eyes were on this new, surprise adult. So, there, that's my small slice of life today - the magic of an unexpected lunch guest.